Generally speaking, the text on a scanned PDF is not selectable. To edit scanned file online, you have to make sure the PDF text is selectable. To make the PDF text editable, the first thing to do is performing the OCR feature to recognize the text. This article will tell you the guide on editting scanned PDF in Adobe® Acrobat® as well as another great way to accomplish the task with PDFelement. 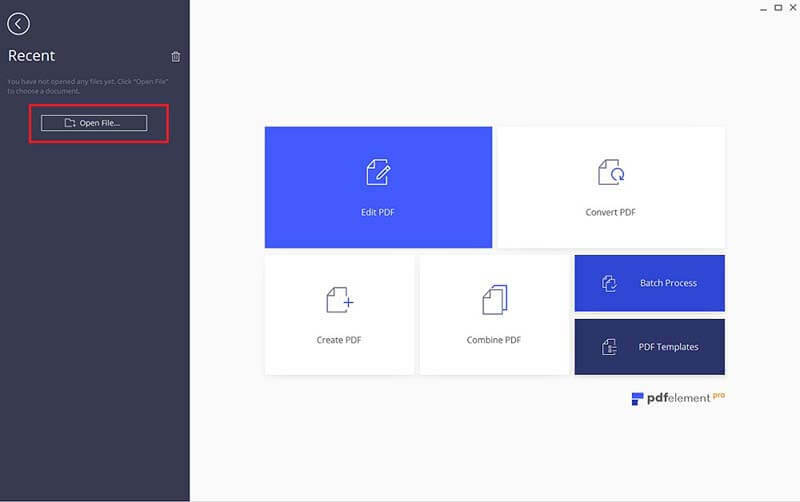 Launch PDFelement on your computer and then click the "Open File" button to import the scanned PDF you're going to convert. PDFelement will automatically detect your scanned PDF and remind you of performing OCR. Click the "Perform OCR" button on the top information bar. On the pop-up, select the right language for the PDF image. After performing OCR, your file is ready to be edited. To modify or insert PDF text, click "Edit" button under the "Edit" tab and then move your mouse to the PDF where you want to edit the text. Click the text block. When the cursor appears, enter the right text. To edit or insert images, in the "Edit" tab, click the "Add Image" button to add an existing image to your PDF. 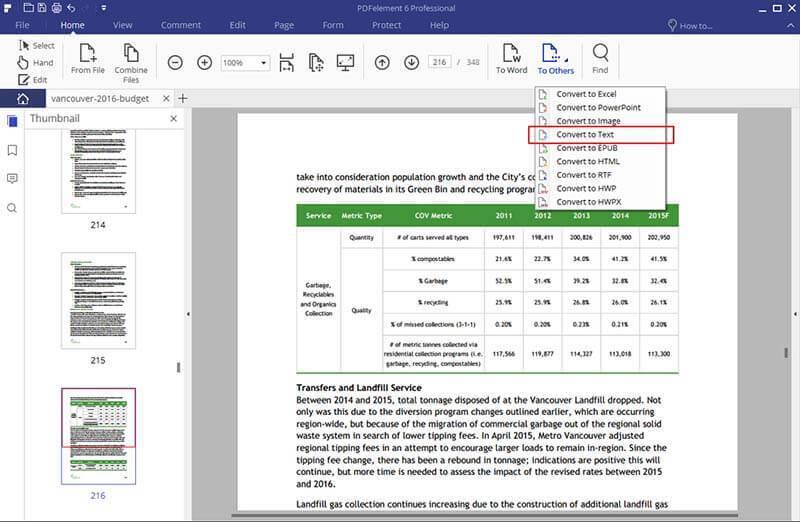 To annotate PDF, navigate to the "Comment" tab and you can see that PDFelement provides a range of annotation tools for you to annotate the PDF content. Users are able to add sticky note, text box, highlight, underline, strikethrough PDF text, and markup PDF with all kind of shapes. To manage PDF pages, go to the "Pages" menu, click the corresponding tool to delete pages, extract page, rotate pages, etc. Only Adobe Acrobat Pro DC has OCR feature, and the Acrobat Standard DC doesn't have built-in OCR. 1. If what you use is Adobe Acrobat 9, just choose Document > OCR Text Recognition > Recognize Text Using OCR. 2. If in Acrobat X Pro, select Tools > Recognize Text > In This File. 3. 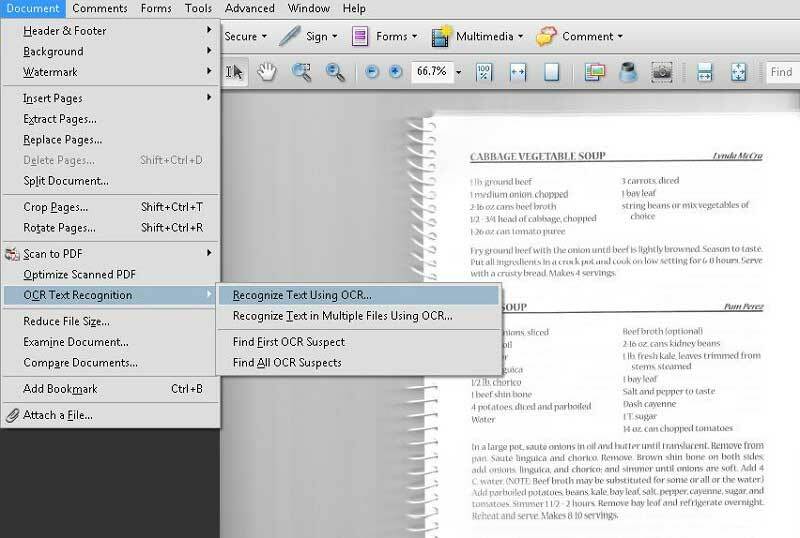 After finishing the OCR process, the scanned PDF file turns into editable and searchable. 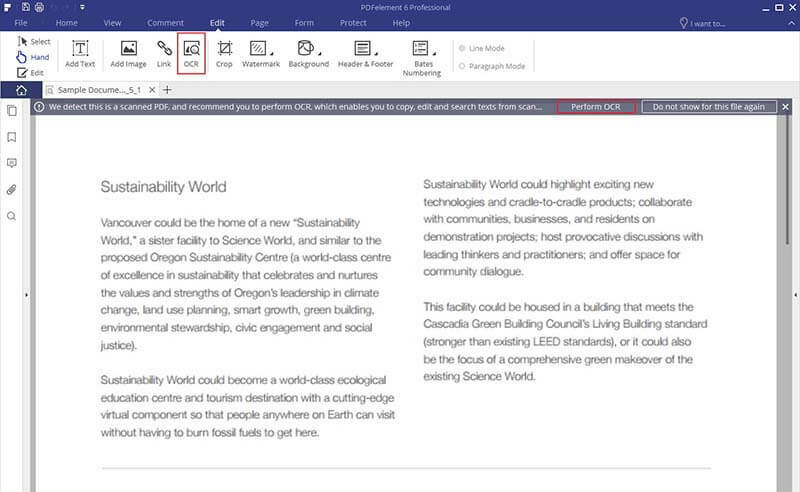 Then you can use the editing tools to make changes to your PDF files, as editing the text and image, add annotation to PDF files and more.